The Center for Faculty Excellence is pleased to present award-winning faculty members, and to highlight educators who are innovative in the classroom. 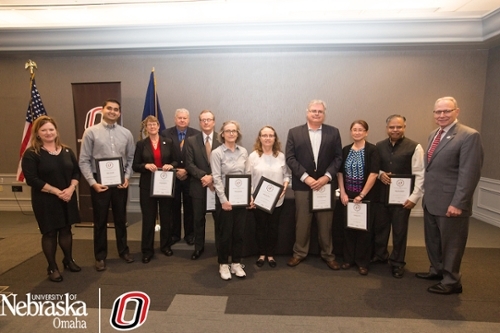 Faculty Honors Convocation was held on April 18th, 2016 to recognize UNO's outstanding faculty. We would like to congratulate and recognize the award recipients! Neal Grandgenett is the Dr. George and Sally Haddix Community Chair of STEM Education in the College of Education at UNO (Office of STEM Education). Grandgenett teaches undergraduate and graduate courses in STEM education, interdisciplinary learning, and research methods. His efforts have established dual pathways for P-12 STEM teacher certification and engaged thousands of teachers in learning with educational robotics and wearable technologies. Grandgenett’s research interests focus on the investigation of technology-based learning in STEM education. He has authored more than 130 articles and research papers, five book chapters, and one full novel. He has been a Principal Investigator or Co-Principal Investigator on nearly $18 million in federal grants, 10 from the National Science Foundation. Bruce Johansen is a Professor of Communication and Native American Studies at UNO. Johansen has mentored numerous students over the course of his 34 year teaching career at UNO. He frequently writes about environmental subjects and has authored 44 published books. His writing has appeared in The Atlantic, The Washington Post, The Progressive, The New York Times, National Geographic, and The Wall Street Journal. Johansen has an international reputation as a scholar and interpreter of Native American history, and is an expert in environmental issues such as global warming and chemical pollution. Johansen has received the Award for Distinguished Research and Creative Activity for his work, and has also held a Kayser Chair, and Isaacson and Reilly professorships. Elliott Ostler’s unique approach in using innovative technology to teach math and science to non-traditional learners has led to consulting projects for NASA's Jet Propulsion Laboratory, Texas Instruments, and The College Board, all of which have invited him to consult on projects ranging from curriculum review to product design. The application of his own research led to the development of an innovative mathematics teaching tool, which earned a United States patent and ultimately evolved into a successful business venture called the Initiative for Instructional Inventions and Solutions. Since formalizing this business commitment, he has distributed nearly 11,000 of his unique teaching instruments nationwide and trained more than 1,000 mathematics teachers to use it. Today he continues to pursue his vision of reinventing STEM instruction through the development of innovative teaching tools. UNO's Department of Foreign Languages and Literature is an inherently interdisciplinary department that aims to internationalize the UNO curriculum, to deliver engaging, rigorous, and student-focused instruction, and to serve the Omaha community. The department stands out due to its collaborative culture and focus on student success. Its innovative curriculum incorporates new technologies into classes, updated teaching methodology and course delivery methods, travels with students abroad, and performs community outreach with students. All of these activities not only promote student learning, but also foster studentfaculty relationships that continue even after graduation. In the last five years, faculty have received 13 awards recognizing excellence in teaching, student mentorship, and service. Abbie Syrek has several roles at UNO. She is the Director of Forensics, teaches communication studies courses, and is the course supervisor for argumentation and debate. Under Syrek’s direction, the MavFORENSICS team has grown into a national powerhouse. They have placed in the elite top-10 programs in the nation for the past seven years, ranking top-5 three of those years. Three of her students were named to the All-American team, and MavForensics has won six national championships in seven years. This success led Syrek to be named the American Forensics Association’s Outstanding New Forensics Coach in 2011. Syrek is a proud Maverick and truly believes that UNO is the place to be. She has empowered her team to find their voices, become lifelong advocates, and be true representatives of UNO's core values. Ana Carballal’s expertise is Galician studies and Postcolonialism. She also has published work on topics including immigration and exile and Afro-Hispanic literature and created courses on topics such as Don Quixote, the Spanish Civil War and Spanish Women Writers. Her students serve Girls Inc., the Juan Diego and Chicano Awareness Centers, and others, using their Spanish skills to teach, translate applications, help newcomers with paperwork, and more. Dora Matache’s academic expertise is mathematical modeling and analysis of the dynamics of logical networks that are common in artificial life and in real-life areas such as genetics, biochemistry, social sciences, prediction markets, and physics. She also is a promoter of the inquiry-based learning paradigm in teaching that shifts focus from lecture to independent learning by students so that students become their own teachers. Julie Pelton’s primary focus is the sociology of teaching and learning. She has worked extensively with her undergraduate theory courses to understand how sociology majors learn and whether student-learning outcomes can improve through use of effective learning strategies. She also is the Online Sociology Program coordinator and undergraduate advisor at UNO. Birud Sindhav teaches courses at four levels of study: Marketing Research to undergraduates; Doing Business in China in the MBA program; Leadership and Managerial Toolkit in the Executive MBA program; and Marketing Management in Executive Education. Other teaching interests include Social Media Marketing and Marketing on the Internet. He also is a senior research fellow for the Institute for Collaboration Science at UNO. Doug Paterson has focused on community-based theatre for most of his teaching and professional career, including the development of a service-learning course, Theatre for Social Justice. His work in Augusto Boal’s Theatre of the Oppressed has led him to begin the internationally known Pedagogy and Theatre of the Oppressed Conferences, now in its 22nd year, and to travel the world teaching its practices and using the conferences for community dialogue. Franklin Thompson’s areas of expertise are in human relations, race relations, multicultural education, urban education, conflict management, counseling, and working with at-risk youth. Thompson also volunteers with the African-American Empowerment Network and several other community-based intervention groups. He also is a four-term member of the Omaha City Council, earning election first in 2001 and three times since as the District 6 representative. Dhundy Bastola studies information transmission and exchange in living systems with a particular interest in life-supporting mitochondrial organelles that are instrumental to cellular regulation and cellular energy. His work helps determine the status and general health conditions of protein, systems or cells, and is relevant to the study of pathological conditions including cancer, neurodegenerative diseases, diabetes, and aging. He also studies communication methods between health service providers and patients. Kerry Beldin focuses her academic activities around training professionals about mental health issues, and improving intervention efforts targeting violence against women. She has taught a variety of courses at the graduate level and developed two courses for the Grace Abbott School of Social Work that reflect those interests. She also is an assessment/audit coordinator for Lancaster County’s Community Assessment/Safety and Accountability Audit. Stuart Bernstein has taught construction management and leadership classes for 14 years, following a 25-year career in the construction industry. He works closely with area secondary schools, building relationships that encourage students to enter the construction management field. He frequently incorporates service-learning projects into his classes. UNO Alumna Angela Eikenberry is a professor in the School of Public Administration who enjoys working with her supportive, kind, and hard-working colleagues. She is an accomplished researcher whose work is being honored with the UNO ADROCA Award. Eikenberry’s research has been featured on NPR’s “All Things Considered” and in the Stanford Social Innovation Review. Her book, Giving Circles: Association, and Democracy, won CASE’s 2010 John Grenzebach Research Award for Outstanding Research in Philanthropy. One of her biggest career moments was being selected for a 2014-2015 UK Fulbright Scholar Award to study giving circles in the UK. Ann Fruhling is a Mutual of Omaha Distinguished Professor of the College of Information Science and Technology, and the founding Director of the School of Interdisciplinary Informatics at UNO. She also is an Associate Professor and the Director of the Consortium of Public Health Informatics, and was promoted to Professor, effective August 2016. Ann is performing life-changing work at UNO and was the Principle Investigator for an Emergency Response System for Public Laboratories that protects citizens against bioterrorism threats. She believes that UNO is an inspiring place to learn, create, innovate, and conduct exciting and meaningful research, and she enjoys the opportunity to make positive contributions to the community and the exciting vision for the future. Sandra Rodríguez-Arroyo is an Assistant Professor of Education, the faculty contact for the English as a Second Language (ESL) and Bilingual Education teacher education programs, and a faculty member with the Office of Latino/Latin American Studies. Throughout her career, she has become a community-engaged scholar. Rodriguez-Arroyo has been able to connect her teaching, research, and service through service learning and act as the faculty liaison for Metro Area Teachers of English Language Learners (MATELLS). She now has three courses that include service-learning experience, has presented and published research on it, and was the recipient of Nebraska's Campus Compact 2015 Excellence in Community-based Teaching and Scholarship Award. MATELLS is an ESL network that is an Advisory Board with ESL coordinators from the Omaha Metro Area school districts and Teaching Circles for teachers of English Language Learners.